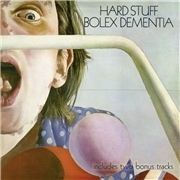 The second album of 1971/72 success HARD STUFF ”Bolex dementia” was another example of an album that was delayed in the wrong time. But after a serious accident traveling from a gig in Frankfurt´s Zoom Club the band had no choice since their guitarist/vocalist and drummer were hooked up in a Belgian hospital, lucky to be alive. Almost a year after the iron was hot this cramped release was first heard, sporting a legendary awful cover, which did them no favors. The band broke up shortly afterwards, with DuCann and Hammond reforming ATOMIC ROOSTER, and Gustafson joining ROXY MUSIC. Is the album as bad as the cover? The subject of the title is madness, and the title track, hushed away at the very last spot of the B-side, is not short of that description. An incoherent mess of distorted voices and other signs of madness, it would scare of the most ardent fan in a whiff. For once my scribblings in the info sheet reek of disappointment. The sheer dissonance of a group apparently travelling in different directions shine through in tracks like the incoherent “Ragman” that has only the guitar solo to brag about, the half-funk of “Libel”, the word overkill of the seventies comedy “Jumpin´Thumpin´(Ain´t That Somethin´)” and the over long “Mermany”, the latter killing off many good aspirations as the minutes pass. Still there is the opener “Roll a Rocket”, a happier track than on the entire debut, the Purple pleasures of “Spider´s Web” and the howling guitar and thumping refrain of “Dazzle Dizzy”. But it all feels somewhat wasted on this album. The bonus tracks also lacks the unity of the first album, they might be the very best sign of the forthcoming split. The single title track, “Inside Your Life” has a totally different sound, it sounds older. The vocals are too high-pitched, it comes across as highly constructed and almost unnatural for the band. The B-side, “(It´s)How You Do It” is a seventies boogie with a pinch of the sixties. The drive is reasonable, it would have been a far more convincing A-side, as it is more in line with the band´s output in general. Harsh words perhaps, but I believe that John expressed his woes about the second album being a mishap somewhere in the excellent booklet. If you have most of John DuCann´s output you must buy this, if not, leave it be.